Responsive inverse opal hydrogels functionalized by boroxole moieties were synthesized and explored as sensor platforms for various low molar mass as well as polymeric diols and polyols, including saccharides, glycopolymers and catechols, by exploiting the diol induced modulation of their structural color. The underlying thermoresponsive water-soluble copolymers and hydrogels exhibit a coil-to-globule or volume phase transition, respectively, of the LCST-type. They were prepared from oligoethylene oxide methacrylate (macro)monomers and functionalized via copolymerization to bear benzoboroxole moieties. The resulting copolymers represent weak polyacids, which can bind specifically to diols within an appropriate pH window. Due to the resulting modulation of the overall hydrophilicity of the systems and the consequent shift of their phase transition temperature, the usefulness of such systems for indicating the presence of catechols, saccharides, and glycopolymers was studied, exploiting the diol/polyol induced shifts of the soluble polymers’ cloud point, or the induced changes of the hydrogels’ swelling. In particular, the increased acidity of benzoboroxoles compared to standard phenylboronic acids allowed performing the studies in PBS buffer (phosphate buffered saline) at the physiologically relevant pH of 7.4. 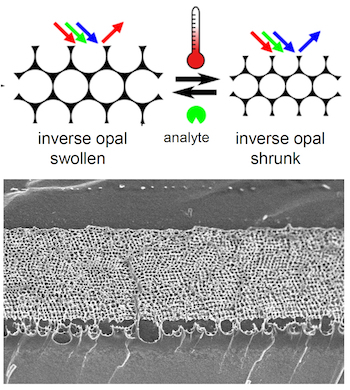 The inverse opals constructed of these thermo- and analyte-responsive hydrogels enabled following the binding of specific diols by the induced shift of the optical stop band. Their highly porous structure enabled the facile and specific optical detection of not only low molar mass but also of high molar mass diol/polyol analytes such as glycopolymers. Accordingly, such thermoresponsive inverse opal systems functionalized with recognition units represent attractive and promising platforms for the facile sensing of even rather big analytes by simple optical means, or even by the bare eye.